Experience the strange sounds of the synthorganic post-vilmoniclysmic far future in the relative safety and comfort of your own home. 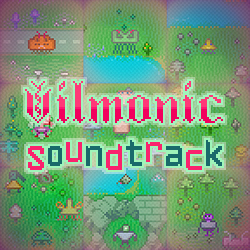 This collection of outstanding music includes 20 songs from the Vilmonic Soundtrack as well as 3 BONUS TRACKS never before heard outside of the Vilmonicomputer. All 23 tracks brought to you by the world-class masterful virtuoso experimental band Wizardmaster​ in hi-fidelity MP3 and lossless FLAC formats.